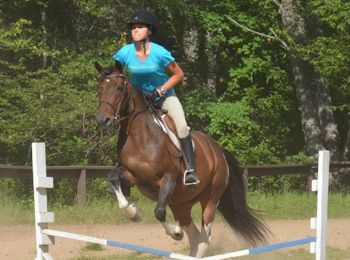 At Camp Jeanne d’Arc, year after year, our top summer camps offer a wide variety of activities from soccer to hiking, archery to arts-and-crafts, water-ski to horseback riding- there’s hardly anything we don’t do! Our mornings are more structured, and our afternoons more flexible. By sun down, every camper has enjoyed a full day of activities! CJDA’s waterfront on pristine Lake Chateaugay provides a beautiful setting for all types of water sports. We offer swim lessons, waterskiing, wakeboarding, paddle boarding, canoeing, sailing and lots of fun and games. Every camper will have an opportunity to spend time at the waterfront every day. All waterfront activities are taught and supervised by certified Red Cross instructors and lifeguards. One of our most popular waterfront activities is water-skiing. 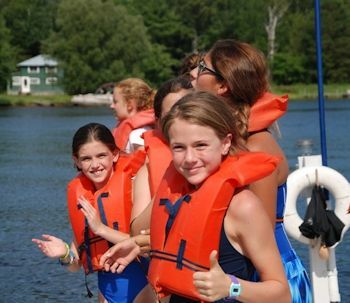 Every boat driver is NYS certified, and every lesson is supervised by an ARC certified lifeguard and taught by an experienced water-skier. Whether your camper has never been on water-skis, or is an experienced skier, she will have a blast on the lake. Horseback riding is an optional activity offered 3 or 6 times per week to novice through advanced riders. Our well-qualified director and instructors put safety first! Our instructors teach mostly English style, with an emphasis on good horsemanship. We strive to build a bond between our girls and our horses. Trail rides and horse shows are part of the fun as well. In addition to land sports, as a part of our adventure camps we offer a mountaineering program that teaches skills that instill self-reliance in the outdoors and nature appreciation. Starting with short day hikes and overnights to nearby campsites, campers have an opportunity to advance to more challenging backpacking and canoe trips in the Club program. 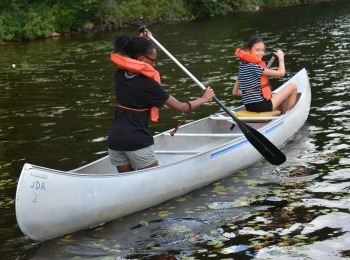 In addition to regular activities, we offer a Club program which allows campers further opportunities to excel and demonstrate mastery in canoeing, horseback riding, mountaineering, and sailing. We believe top summer camps should allow opportunities for further development in campers’ favorite skills/activities. As campers work for multiple summers to earn placement in a club, they learn the value of hard work and real accomplishment. Archery and Riflery are two camp favorites. Both activities are taught by trained instructors on a safe and well-marked range. Campers set goals and earn awards as they advance in the Camp Archery Association and National Riflery Association Programs. 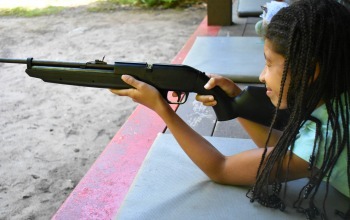 Our campers under 12 years old will shoot BB guns at a shorter distance. 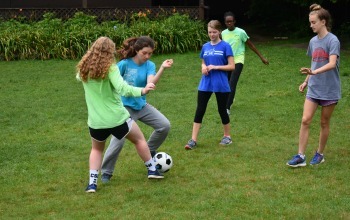 Our adventure camps allow our girls to also show off their new skills in an end-of-summer tournament. Our core sports include soccer, field hockey, volleyball, tether ball, tennis (USTA program) basketball and more. Golf is offered as an optional activity once a week at the Malone Golf Club with PGA professionals. 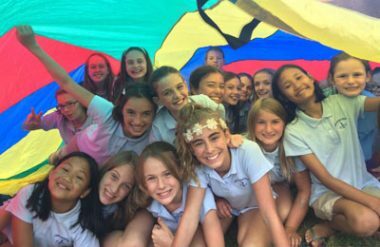 Our campers’ top summer camp activities often include large field games such as Capture the Flag, Run Sheepie Run, SPUD, kickball, softball, parachute games, and Ditch. And the Fourth of July and certain other days wouldn’t be the same without our massive slip-n-slide down Archery Hill. Using everything from traditional art media to pine cones found in the woods, our campers enjoy hours of gently guided quiet time to create beautiful and sometimes whimsical pieces of art. 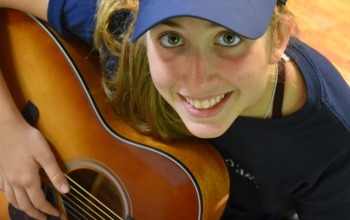 The performing arts are also a big part of life at Camp Jeanne d’Arc. 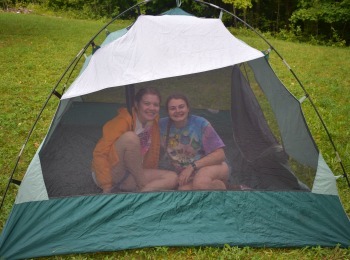 Campers will have an opportunity to participate in drama, dance, music, and lots of singing. Every Wednesday we host a camp-wide talent show where campers have an opportunity to perform. We believe that top summer camps should allow campers to have a say in which activities they are most excited to try! So, in the afternoon campers choose the activities they would like to do. Afternoon “choice activities” are more specialized and may including baking/cooking, guitar, yoga, sailing, clubs, fishing, drama, dance, fitness training, board games, quiet time, field sports, bracelet making, and more. Optional activities are additional activities offered above the standard programming. Optional activities include horseback riding, water-ski, and golf; which are worked into a camper’s daily schedule. In additional, optional Motor trips (off site trips) are offered 2 times throughout the summer. For more information, review our summer camp dates and tuition. 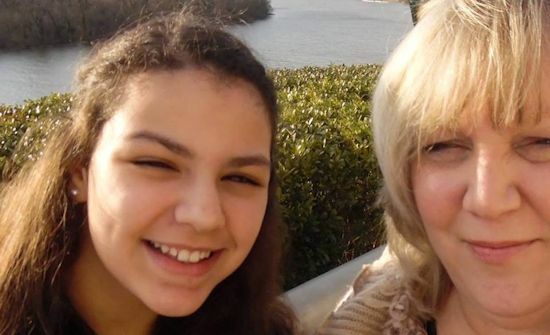 Lisa Z., Parent from D.C.